We’d love your help. 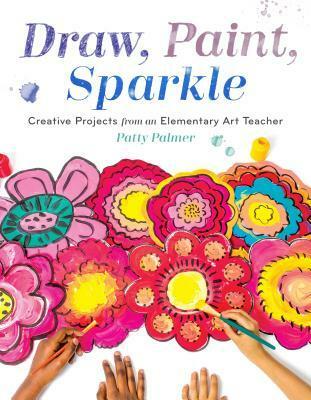 Let us know what’s wrong with this preview of Draw, Paint, Sparkle by Patty Palmer. Art made easy--25 kid-tested lessons in drawing and painting. Perfect for children ages 5 to 10. Encourage and empower kids to make art. The 25 art lessons in this book present detailed drawing instructions paired with a range of painting techniques and styles for endless creative exploration. Especially helpful for those overwhelmed by the blank page or unsure of where to Art made easy--25 kid-tested lessons in drawing and painting. Perfect for children ages 5 to 10. To ask other readers questions about Draw, Paint, Sparkle, please sign up. I received a free e-copy of this book for review purposes, but I will be buying myself a physical copy. I've been enjoying the author's blog, Deep Space Sparkle, for years-- but having these projects available in book format is going to be so much more useful to me. The projects are fun and attainable, I anticipate my kids really enjoying them. The layout is striking-- clean and pretty and intuitive. Glad to be able to add this to my collection. Encourage and empower kids to make art. The 25 art lessons in this book present detailed drawing instructions paired with a range of painting techniques and styles for endless creative exploration. Especially helpful for those overwhelmed by the blank page or unsure of where to begin, each lesson provides concrete methods for getting started using clear steps for drawing, and then invites kids to unleash their creativity through color and paint. Along the way, learn tips on using different art materials and discover art techniques to add variety and ease to the projects. More than just a simple how-to draw and paint book, Draw, Paint, and Sparkle guides parents in feeling confident in their ability to have a role in their child's artistic development. Developed by an experienced art teacher, Palmer holds your hand from the beginning all the way to displaying your child's finished artwork. PATTY PALMER has built a successful online business around art education. She has been teaching art to children in the classroom setting for twelve years and decided in 2009 to share her lessons online. What started out as a venue to share ideas quickly and seamlessly grew into a business. Deep Space Sparkle (DSS) is recognized around the world for providing art inspiration, teaching resources, and project ideas. Thousands of teachers and parents have taken Deep Space Sparkle art e-courses and over twenty-thousand people have purchased DSS products. Patty holds her own Deep Space Sparkle conferences and is sought after to speak at other art and education conferences. She is a master educator and savvy business woman who has an eye for great design and a keen awareness of what parents and educators want and need in this space. She lives in Santa Barbara, CA, with her husband and three children. Encourage and empower kids to make art! The 25 art lessons in this book present step-by-step drawing instructions paired with a range of painting techniques and styles for endless creative exploration. Designed by an elementary art teacher, each creative exploration offers tips on using the be I received a DIGITAL Advance Reader Copy of this book from #NetGalley in exchange for an honest review. · Beginner projects. Discover easy ways to get started making art. Through flexible instructions, you’ll create big and bold paintings. · Art lessons inspired by the masters. With projects based on celebrated painters like Van Gogh and Monet to contemporary artists like James Rizzi and Jackson Pollock, you’ll explore a range of painting techniques and styles. · Paintings inspired by nature. Draw and paint familiar and imagined landscapes and animals as a fun way to engage with art. More than just a simple how-to-draw and paint book, Draw, Paint, Sparkle is an invitation for kids to unleash their creativity through color and paint. The art lessons in this book were solid: great instructions on drawing and painting would make this an artsy-incredible way to spend the summer. Even adults could take away from this book, especially in the Master Artist section. Great book that will be undoubtedly out of our library all the time! p.s. Funky cat, funky cat, how darn cute are you? Thanks to Roost Books and NetGalley for the review copy. Opinions are fully mine. By far, one of the best elementary art books I’ve read. Super clear, easy to read, helpful, and complete. I’d highly recommend this to all art teachers and anyone who enjoys creating art with kids. I’ll definitely use several of these lessons with my classes. If you are working with kids and want to be creative but don't know where to start this book helps give you various ideas of painting projects that you can do with just one kid or a whole group. It gives reasons why different projects are learning lessons as well. Recently I had my grandchildren to entertain during the school holidays, they love making things, but I was a little lost on how to keep their interest. I wish I had this book to refer to!! It really lay out a type of plan, which includes supplies and how to encourage exploration and confidence. I think this book is really fabulous, it can be adapted to any age group and it actually freed my own mind to the possibilities of various art styles and understand of children's development. Really love Recently I had my grandchildren to entertain during the school holidays, they love making things, but I was a little lost on how to keep their interest. I wish I had this book to refer to! !